Vancouver Island is home to thousands of black bears and while it's exciting to take backcountry tours to experience wildlife in its natural habitat, it's not always necessary to work that hard - especially when you are staying at the Hummingbird in Port Alberni! 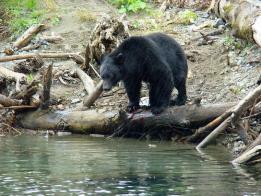 Our adventurous black bears like to play and catch salmon right across the Somass River, in front of the B&B Inn. And they can often be found snoozing in the warm sunshine in the Hummingbird's backyard or climbing the various fruit trees and munching on the blackberries. 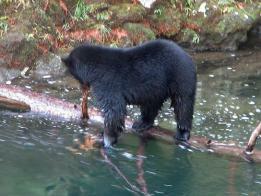 The best time is in late summer and early fall when both the fruit and salmon are plentiful. 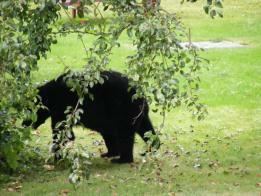 Imagine looking up from breakfast to see a black bear ambling through the back yard. Have your cameras at the ready! The Hummingbird is a perfect vantage point for human admirers to catch the bears in action!